Not hard to figure out what this post is going to be about. Vino! There was a newspaper article recently about impulsive online shopping while drinking and how the purchasers (what they called “boozy shoppers”) often regretted their choices. We recently had an experience doing this, but were thrilled with the results. A few weeks ago, we were drinking a bottle of wine from Symphonia. It was a great wine from a winery (now owned by Sam Miranda…more on that later) we had never heard of in the King Valley, a place we had never heard of. So, Dan goes online, looks at the Sam Miranda website, and sees the link about King Valley; before sobering up he had booked the New Year weekend on the edge of a remote village called Myrrhee (pronounced my-ree). Lisa had gone to bed hours earlier, long after that bottle was gone. But, luckily, Dan waited until the next morning to get Lisa’s stamp of approval before providing his credit card details to secure the booking. La Cantina winery. An old Italian guy making old-style Italian wines, and selling them in an old Italian-style building. King Valley history in a nutshell is this: a lot of Italians moved there a couple of generations ago. They were tobacco farmers. When people stopped smoking as much, they did what Italians do best – plant vines and make wine! And fortunately, they did it how they’ve always done it; they took advantage of the climate (similar to northern Italy) and grew grapes. Most of them sold their crop to bigger companies in the area; some people we spoke to were proud of these relationships, while others spoke of being time of being “exploited” through small payments for grapes. Eventually, many started making their own wines too, often cutting ties with the “corporates” completely. Now, there are small family wineries making wonderful Italian-style wines (from grapes like barbera, nebbiolo, sangiovese, pinot grigio and arneis) that are lighter and more complex than the ubiquitous Aussie shiraz, cabernet and chardonnay. And where you have great wine and lots of Italians you’re also bound to have great food. The King Valley is no exception! There is a great food(ie) culture in this region, where the signs note that you’ve entered a “Gourmet Region” of Australia. 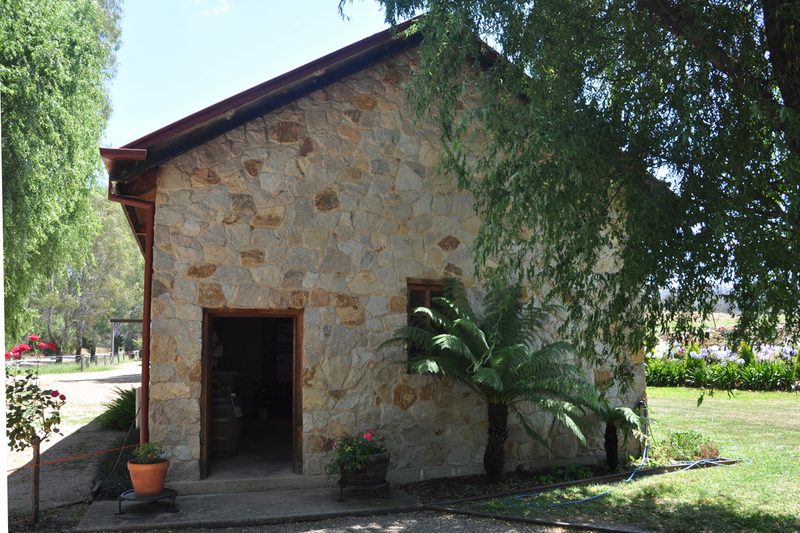 Many of the wineries have superb restaurants and there are some interesting food producers too. King Valley Fine Foods makes dips and pestos from a variety of ingredients; the Milawa Cheese Factory is heaven for anyone who isn’t lactose intolerant. 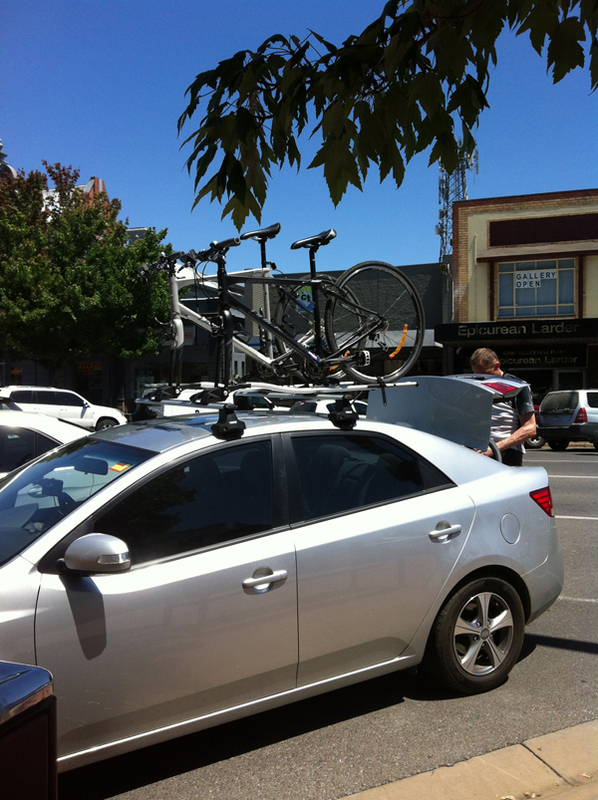 Loading up the bikes in Wangaratta. As you can see by the sky, it was an absolutely beautiful day! Another feature of this region is the Murray to Mountains Rail Trail, a network of about 100 km of bicycle trails. The network is made up of mostly reclaimed railway tracks, with some other trails now added. Much of it is flat and straight and fun to ride and goes through scenic rural countryside. There are fields of cattle and sheep, birds, trees, streams and dams, and the trail is easy enough that you can actually look at them as you ride. So, what was our weekend like? Started off with a ride on the rail trail. We both went from Bowser to Tarrawingee (gotta love Aussie place names!) and back (about 25 km); then Dan put Lisa’s bike back on the roof of the car and continued on to Wangaratta (aka ‘Wang’, only another 8 km). Lisa picked him up there, and we drove to Milawa. There we did a little bit of exploring (there isn’t much there really!) 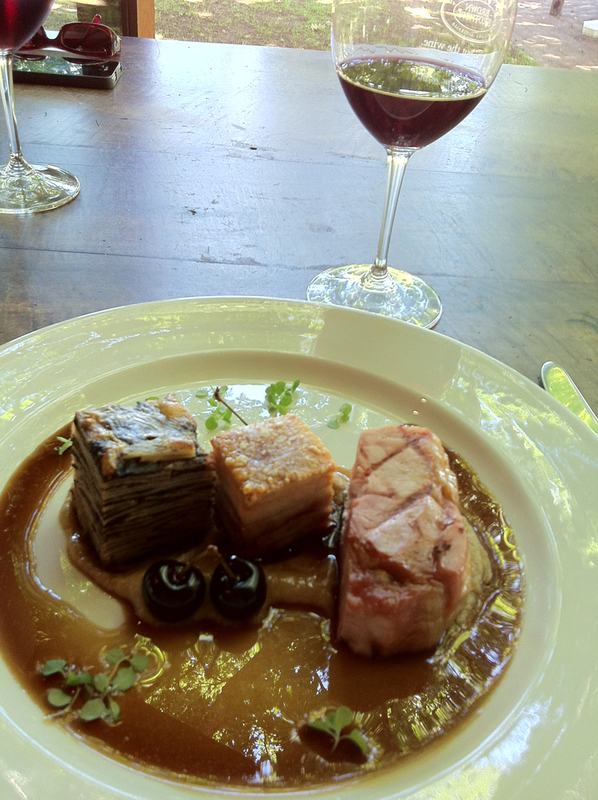 and then went for a spectacular lunch at Brown Brothers wines. Dan's lunch of pig (3 ways) at Brown's. Yummy. Browns is the oldest winery in the area, and also the largest by far. They have a great restaurant and property, and the wines are OK but nothing special. And then off to find our accommodation. Casa Luna Gourmet Accommodation is a collection of tin buildings on the side of a hill just north of Myrrhee (about 25 km south of Milawa). It isn’t really in the King Valley; it is on the west side of the ‘mountains’, overlooking Boggy Creek and a whole lot of vineyards. It was beautiful! Lots of birds (parrots, cockatoos, wrens, silvereyes, goldfinches…), some kangaroos, millions of butterflies, supposedly some wombats (though we didn’t see them), cows, etc. A nice rural escape. We checked in, Lisa read while Dan went for a quick ride through the region (another 13 km in a brutal heat! ), then the host brought us our dinner of an antipasti plate and a bottle of wine. Best of all – no mobile service! We were off the grid and forced to kick back. Another hot (35C) and sunny day in Oxley. Perfect for kicking back on Sam Miranda's patio, sipping a glass of pinot grigio as we awaited our food. Next morning, after a hearty brekkie, we went back to Milawa, parked the car and cycled almost to Wang. On the way back, we stopped at Sam Miranda winery in Oxley (about 6 km out of Milawa) for a tasting and ended up making a lunch reservation…quick pedal back to the car, changed our clothes and drove back to the winery for another amazing lunch, out on their patio among the parrots… Sam Miranda isn’t a huge winery, but it is pretty spectacular. The cellar door/restaurant is stunning! Make sure you look at the website to see it. Though a relatively small winery in the big scheme of things, Sam obviously has a lot of money to build this place, to buy other wineries like Symphonia, etc. And so bike friendly he even sells jerseys with his logo on them. Yes, we each bought one (Dan’s is white, Lisa’s is rosé). 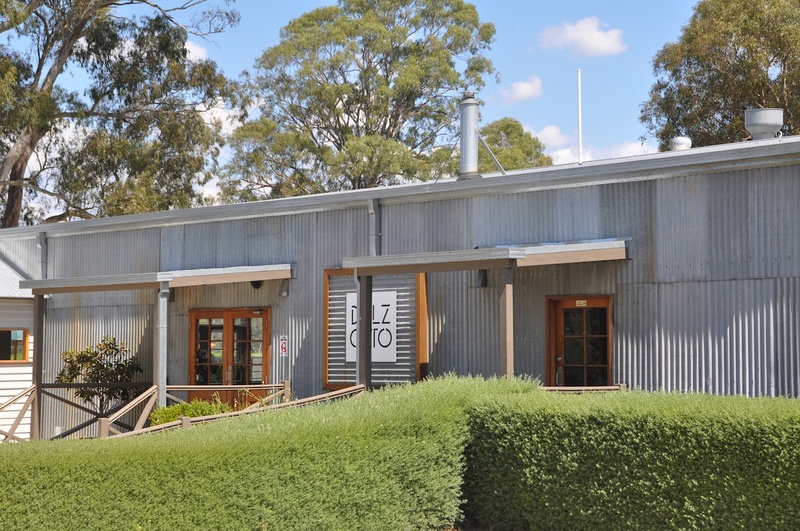 Another Italian family, more Italian-style wines, but Dal Zotto serves theirs up in a more Australian building: a tin shed. After lunch, time to do the King Valley proper. 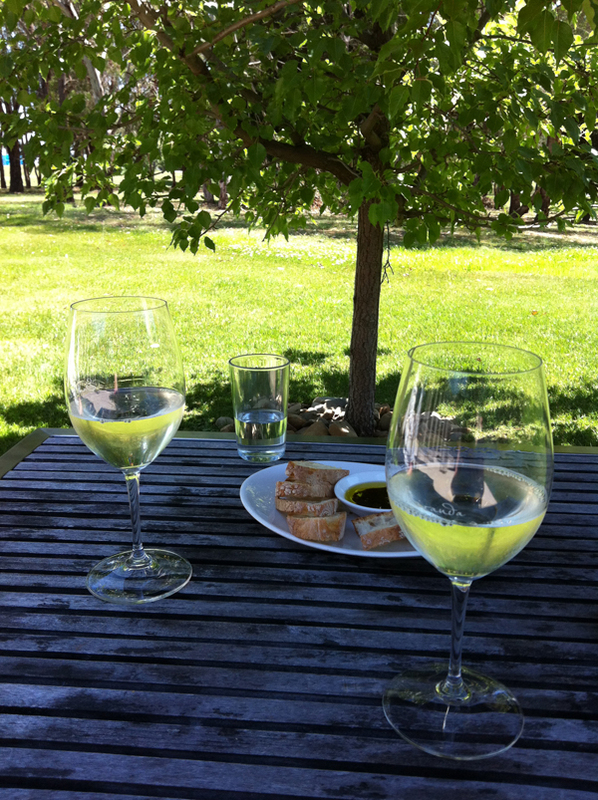 We hit a few wineries, ranging from tiny to medium-sized. La Cantina, for example, is pretty much a one-man operation; the old Italian guy makes great nebbiolo. Gracebrook is bigger, and a two-person operation; he grows the grapes and makes the wine, she runs the restaurant. Dal Zotto was the biggest one of the three that afternoon, and it seems to be pretty much Dad, Mom, a couple of sons and their partners (the person running the cellar door was a daughter-in-law who said she and her husband came back from Sydney to help with harvest 4 years ago and never made it out…King Valley is that attractive!). Dal Zotto was the first in the area to make prosecco, and started a booming tourist attraction known as The Prosecco Trail. They also make great arneis and some really, really good barberas. And then, boot (trunk!) full of wine, we headed back across the hill to Casa Luna for New Year’s Eve dinner. More next time on this fabulous retreat and how we spent the first two days of 2012. And by the way, in case you haven’t done this yet: vote for us in the Canadian Blog Awards for Best New Blog. Please. It would make us really happy (not as happy as we would have been if we had nominated, and won, for the post about Dan’s tattoo, but still happy). 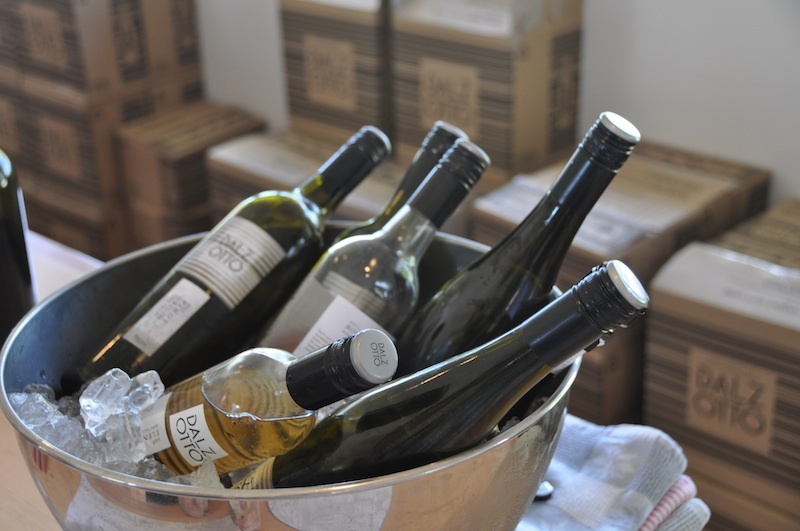 This entry was posted in cheese, cycling, holidays, King Valley, mountains, New Year's Eve, wine, wineries, winter and tagged king valley, wine. Bookmark the permalink.